When first heard the title of the game 'Diamond Chief'', we expected it to have a theme based on some sort of tribal communities, powerful chiefs and an assortment of ritualistic symbols - but there is none of the above. 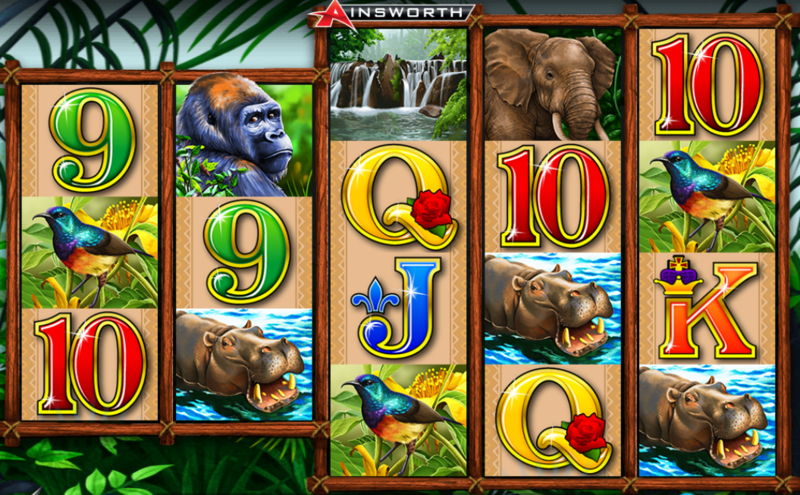 Ainsworth's video slot game features different exotic wild animals that occupy a beautiful green jungle. There is a treasure trove lying beneath the reels waiting to be unravelled by you. You will get the opportunity to travel to the beautiful African forest and enjoy interacting with different wild animal species. The slot is packed with wild scatters, wild symbols, multipliers as well as free spins to boost your gaming experience. The layout is simple like any other slot with 5 reels, 4 rows and 100 pay lines. Players can bet from a minimum of $1 up to a maximum of 10, 000 per spin where you can win a max payout of 500,000. 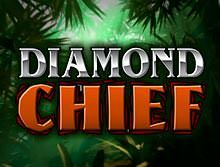 With a medium variance and a theoretical payout of 94.3%, Diamond Chief slot is suitable for players with all budgets. This slot is designed with HTML5 technology, which means you will be able to play it instantly on your tablets, smartphones and desktops. Diamond Chief slot has a blooming design of a tropical island. You will see different green shrubs and a crystal clear sky. The reels are bound together by the wood to create a strange looking structure. Also, the soundtrack and effects are immersive, and they are designed to give you the shrill feeling of a dense forest. The graphics and animations are superb both on mobiles and desktops and offer seamless gameplay. Additionally, Diamond Chief comes with everything you expect on an African wild adventure inclusive of Gorillas, Hippos, Elephants, Birds, and waterfalls. Players will not have any problems playing this fantastic game from Ainsworth developers. The minimum bet amount is $0.01 per line, and you can bet up to a maximum of 10000. The layout is simple and straightforward with 5 reels, 4 rows and 100 betways rewarding from the leftmost to the rightmost. There several betting options at the bottom of your screen that you need to understand their work before you get started. Both the 'LINES' and 'BET' options have (+/-) signs of increasing or decreasing the number of lines and bet amount. Click on the 'Spin' button to set the reels in motion. This button will change to 'Stop' while the reels are spinning and can be used to end the game round. The Autoplay option will enable you to play between 10 and 100 spins uninterruptedly. The symbols you will find in this slot game are what you expect to find when you visit a jungle. They are grouped as high value and low-value symbols and offers different payouts whenever they show up on the reels. The low-value symbols are identified by the traditional playing card symbols J, Q, K, A, 9, and 10. The high paying symbols are represented by the Diamond Chief logo, an Elephant, a Gorilla, a Hippo, a Bird and a Waterfall. Provoke the Chief by digging out his diamonds in the forest. The wild in this slot is represented by the Diamond Chief logo and will substitute any other symbols except the scatter symbol to help form winning combinations on the pay lines. This symbol can only appear on reels 3, 4 and 5. The Diamond marks the scatter symbol and landing three or more of the same symbols in any position on the reels will trigger the free spins feature. Ten free games will be activated whenever three or more scatter Diamond symbols appear. Each symbol on reels 3, 4, and 5 will spin independently. A new Shield symbol will appear on reels 3, 4 and 5 during the free game and replace for all other symbols except the scatters and Diamond Chief. Play Diamond Chief Slot On the Go! If you are a looking for a video slot that will offer you a great gaming experience on the g, then you have come to the right page. Ainsworth has been developing high end mobile video slots since they joined the online world. Diamond Chief slot is perfectly optimised for small screen devices including smartphones and tablets powered by Android and iOS. Ainsworth is an Australian based slots developer but with offices in Europe, Macau, the US and South America. They have been designing great games for the land based and the online industry for more than 20 years. The developer still maintains a well integrated system comprising building and testing of online slot games. Ainsworth holds two master licenses from the UK Gambling Commission and Alderney. Their slot games are compatible with major gaming platforms including mobile, tablets and desktops. You can try out this fantastic slot game for fun or real money at bCasino. We have a wide range of slot titles and other casino game variants from more than 15 leading software developers in the igaming market. All games are tested for fair and random play by an independent company before we add them on our site. You dont have to worry about your safety as our site is secured with the latest 128-bit Secure Socket Layer (SSL) encryption technology. We have a decent bonus program where all new players are rewarded up to $1200 Welcome Bonus to help them start their gambling journey. As well, our regular customers will benefit from our promotional offers which are available daily, weekly and monthly. You can play our Diamond Chief video slot on the go or at the comfort of your home. With our 24/7 customer support service, you will be able to forward your complains at any time to our agents through email, live chat and telephone.